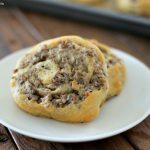 These three ingredient Sausage Cream Cheese Pinwheels are so easy and so delicious. 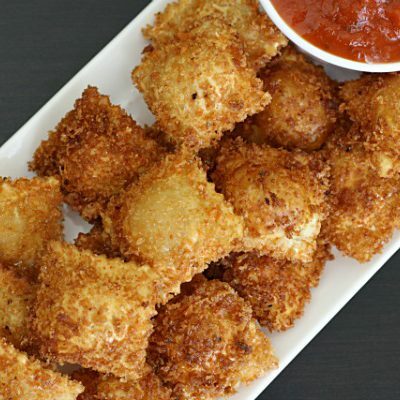 This savory, cheesy, tangy recipe is so versatile and is perfect as an appetizer, party food, or brunch dish. This is a sponsored post on behalf of @JimmyDean. James and I went to a party a year or so ago and they served this sausage and cream cheese breakfast casserole that was amazing. 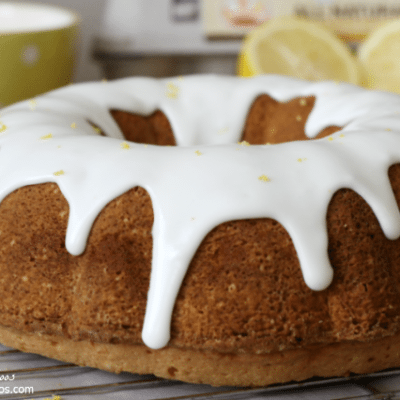 When I asked for the recipe, I couldn’t believe it was only three simple ingredients! 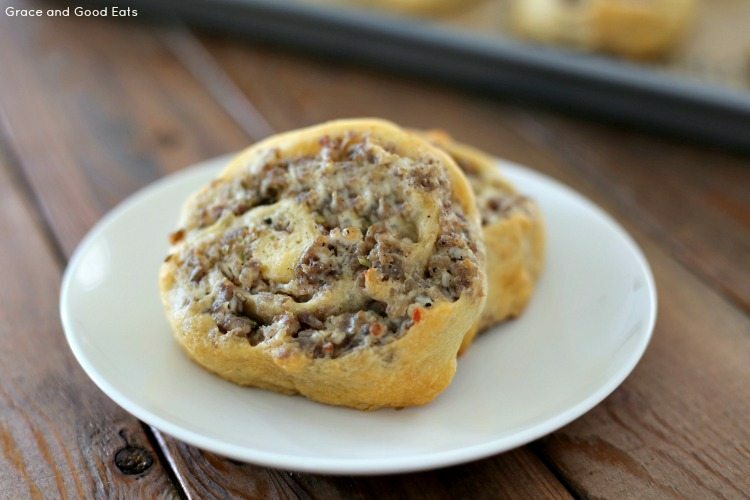 These Sausage Cream Cheese Pinwheels are a play on that breakfast casserole. 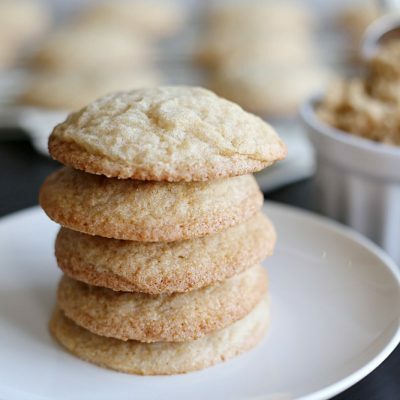 One thing I love about this recipe, aside from it being SO easy, is that it is also so versatile. You can bake it up as a casserole dish (like my Breakfast Cheesecake), in little cups (like my Pumpkin Cheesecake Rolls), or shape them into rounds like I did this time. My family likes heat, so I make this recipe most often with spicy sausage. 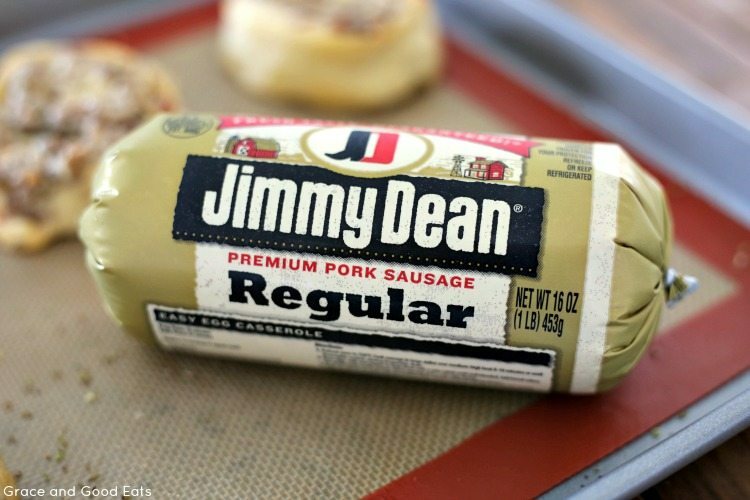 I always keep a roll or two of Jimmy Dean® Fresh Roll Sausage in my refrigerator. You can find Jimmy Dean® Fresh Roll Sausage in a variety of flavors, including Maple and Spicy, in the refrigerated section at your local Walmart. Because Isabella is allergic to beef, I like to use Jimmy Dean® Pork Roll Sausage in a variety of recipes- like my Parmesan and Sausage Bolognese. Roll sausage is versatile for many types of recipes and so easy to prepare. (Sausage and Bean Spinach Dip is another appetizer favorite.) High quality, premium ingredients, and a special blend of seasonings makes Jimmy Dean® Fresh Roll Sausage a product I trust. Of course, the down-home taste of fresh pork sausage is also delicious in your standard biscuits and gravy recipe! 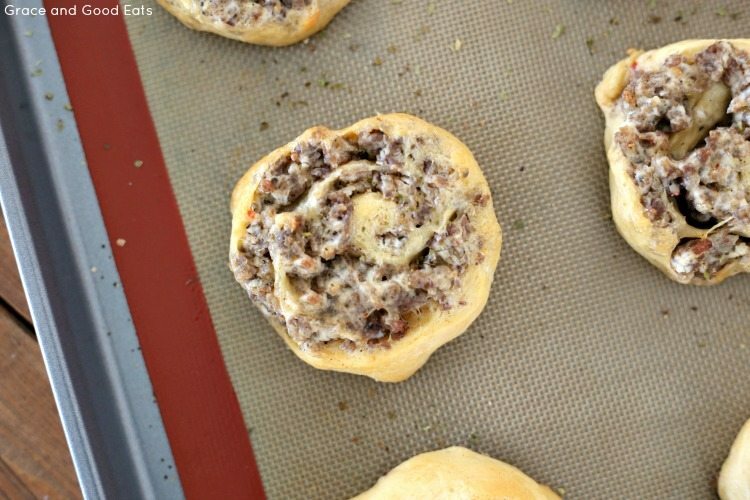 These Sausage Cream Cheese Pinwheels are perfect for a crowd and can be made ahead of time. Make individual servings as an appetizer, or leave it all as one and serve for brunch as a breakfast casserole! 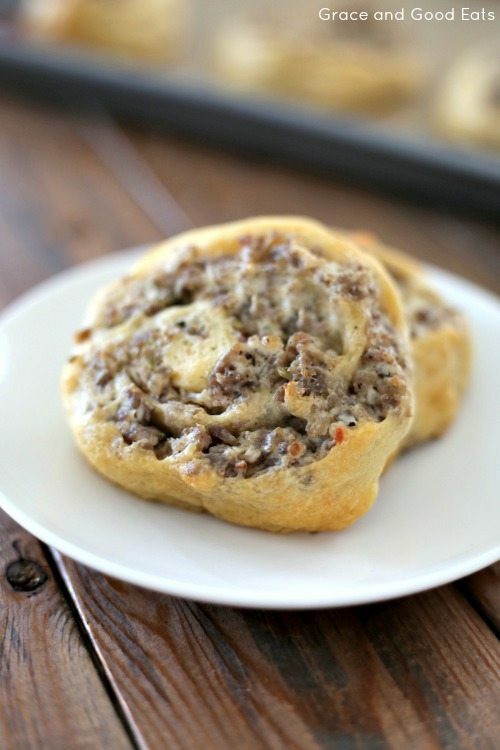 These three ingredient Sausage Cream Cheese Pinwheels are so easy and so delicious. 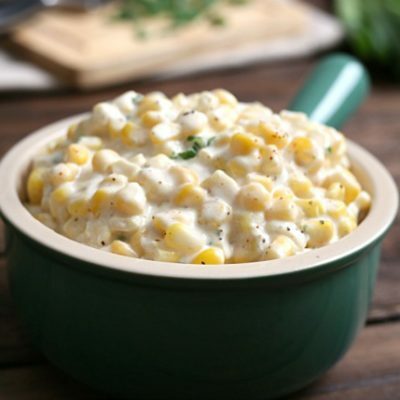 This savory, cheesy, tangy recipe is so versatile and is perfect as an appetizer, party food, or brunch dish. Fully cook the sausage until brown and crumbly. Drain and return to the pan. Combine the cream cheese with the meat over low heat until just incorporated. Allow the mixture to cool slightly. Unroll the seamless dough and spread the cooled meat mixture. Roll the dough into a log shape and slice into eight equal pinwheels. Place the pinwheels on a baking sheet (or pan of choice) and bake for 10-13 minutes, until pinwheels are golden brown. Turned out great and thank you once again! On the second roll I wanted to experiment a little so I sprinkled a pinch of garlic and a little cheddar and then topped them with some Finley chopped chives and we loved it , too. I live with a couple of meet loving and snack obsessed boys,(I need a daughter or estrogen in the mix)so thanks and keep them coming! We are also big football tailgating fans so,I brought these which were were a huge hit and are heavily requested on early game days especially. 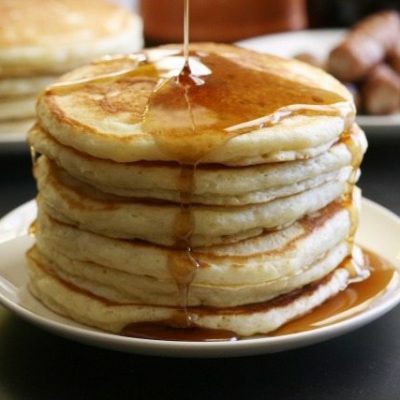 This looks great and super easy. My kind of recipe. 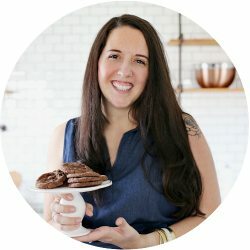 Will be adding it to my next recipe rotation to try out! Thank you!! Could you roll these up and freeze them for a few days before you cook them?? Hi Mary, I’ve never tried that. I’m worried the cream cheese may not freeze well? I’ve frozen the rolls before and it works just fine! Could you please send me the calling cards for the christmas bingo game? Thanks. I just print an extra page of the Bingo cards and use that as the calling card.